Minister Yossi Peled, a Holocaust survivor, could not believe his eyes when he saw the pictures from the ultra-Orthodox protest in Jerusalem's Mea Shearim neighborhood on Saturday night. "I admit that some things are inconceivable, like taking the horrifying picture of the little boy facing the Nazis with his hands up. Regardless of whether the struggle is justified or not, this points to something insane, irrational, immoral," he told Ynet on Sunday morning. Op-ed: Time for Israeli civil war? "Any word you say will be inappropriate. I may be naïve: I never believed, no matter which conflict we're talking about, that we would use symbols of the Jewish people's tragedy for an internal battle. It was our battle against an external threat. It's inconceivable. The blood froze in my veins." Saturday's demonstration was organized by an extreme faction in Mea Shearim in protest of what has been defined as "the exclusion of haredim" and the start of the jail term of an ultra-Orthodox man convicted of assaulting an electronics store salesman. Mordechai Hirsch, one of the leaders of the extreme Neturei Karta faction (and the son of Rabbi Moshe Hirsch, who served as minister in the Palestinian government), said his nephews, who are not even 10 years old, took part in the protest wearing a yellow patch. "Of course I justify it," said Hirsch. "Yes, it's from the Holocaust and it's legitimate. There's no question about it. This protest reflects the Zionists' persecution of the haredi public, which we see as worse than what the Nazis did. "The Germans just killed the body, but these people want to kill the soul, the spirit." Prof. Shevach Weiss, a former Knesset speaker and a Holocaust survivor as well, defined the pictures from Saturday's protest as shocking. "Any type of comparison between events related to the Israeli split and the Holocaust are a crazy illusion. What we are seeing here is people dancing on the blood of Holocaust survivors," he told Ynet. According to Weiss, "Those who choose to go there must be people with pathological problems, something that is not within my profession but complete madness requiring a medical diagnosis." According to Minister Peled, "We reached this stage because there has been a process of years within the Israeli society. Things that years ago no one would dare say or use. There is a loss of internal barriers, a loss of shame. "(Mea Shearim's) Shabbat Square wasn't born yesterday, and there have been conflicts. But I can't remember such things. We've lost something in our moral barriers. We've lost our shame. This is an obvious feature of this phenomenon." So how can the loss of shame be dealt with? "The last thing I would recommend is enforcement or force. I may be naïve. At this point of explanation and dialogue we must declare: Enough. This is beyond what we can handle. "I don't know if it will work. We can suggest legislation and all kinds of things, but there is a basic ethical thing here, Jewish morals. "I'm not sure that talking will help. I don't feel like talking about it, because I don't know which sentence will match the magnitude of the rift I am feeling in the Israeli society. "There are things, regardless of the group one is affiliated with, that belong to all of us. The history and our past belong to all of us. No one thinks these symbols will be used. It offends me as a Jewish person, and thousands others." Peled sounded perplexed, adding that "perhaps at the end of the day, despite what I'm saying, it's impossible to communicate and we'll have to take a different road. I'll be very sorry if we use laws, but if we reach that corner – we'll do it. "If that's our last resort, then it'll be our last resort and we'll be forced to use legal measures." 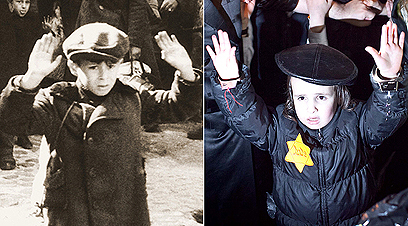 See all talkbacks "Minister: Haredi Shoah display 'insane' "